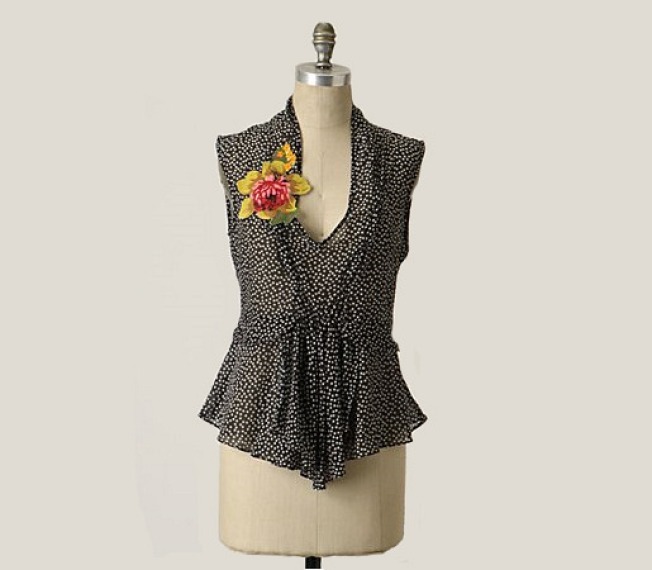 Anthropologie's Dotted Chiffon Blouse ($98) will brighten up your look on dreary fall days. The flowery applique adds a colorful touch on the monochromatic background of teeny dots. Our pairings for the perfect outfit? A bright pink or red cardi, a dark pencil skirt and over-the-knee boots. Available online or at 3222 M St. N.W. Free People's voile lace trim blouse is an extra 10 percent off today -- snap it up for $62.10 from Bluefly.com. Consider this a twofer, with the equivalent of a paisley vest printed onto the cotton-blend voile top. Try out a fitted blazer with this wild one.